Milton Brook Romertopf Pestle And Mortar. 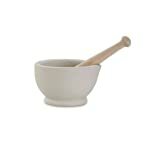 This fully vitrified acid proof porcelain mortar and beechwood pestle handle is a kitchen accessory must. Perfect for gaining full flavour from herbs and spices – no chef should be without one.